When his latest cookbook, Bottega , arrived on my doorstep (thanks to Progresso & MyBlogSpark), I was thrilled. It is a beautiful book, full of gorgeous photographs, stories and of course, recipes. 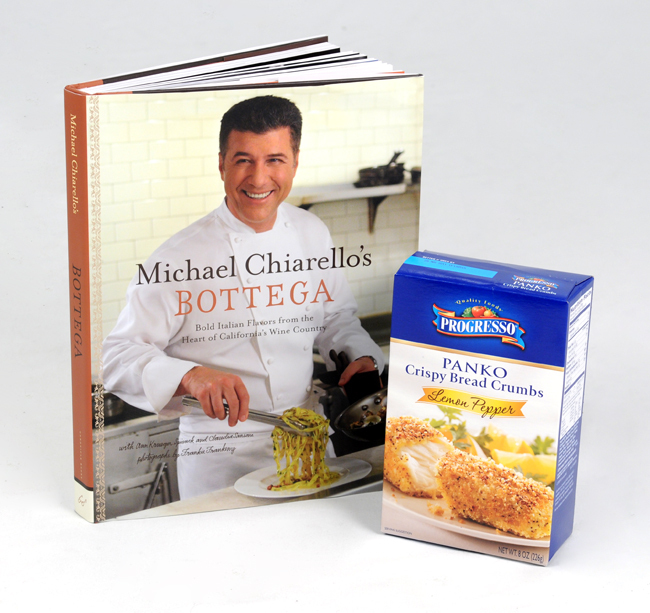 Chiarello has teamed up with Progresso and shared some of his favorite recipes using their light and crispy Panko crumbs. You can visit the Progresso site for additional recipes, tips for cooking with panko, video and a coupon for $1 off any panko flavor. I love these crumbs as they stay crunchy, even when reheating. I mix them with a few spices, some grated parmesan cheese and love to coat chicken tenderloins with them. I am excited that I can share this gorgeous cookbook (with his signature inside!) and a box of Lemon Pepper Panko crumbs with one of my readers. Please fill out my GIVEAWAY form (do not leave your entry in the comments.) On the form, fill out your name, email, the name of the giveaway and your answer to my mandatory question. I will choose a winner with the help of random.org on November 9, 2010. After you enter my giveaway, be sure to check out the Progresso's Wine & Dine with Chef Michael Chiarello Sweepstakes. Until December 31st, you can enter for the chance to win a trip for two to Napa Valley to attend the Spring Bud Break Party, an annual dinner and wine tasting event taking place on May 7, 2011. In addition to two tickets to the party, the grand prize also includes roundtrip airfare and hotel accommodations. Visit www.progressobroth.com for the sweepstakes rules and entry form. I love the Veggie rotolo that a near by Italian Restaurant makes. It is wonderful.